I promise we’re going to show you some of our best explainer videos of the year. But before we get into examples, let’s talk about the one thing that the best explainer videos have in common, and why it’s vital if you’re thinking of using video for your business. At Explainify, we see a lot of clients who know exactly what style video they want, but that’s usually the extent of the planning. That’s what many companies get wrong about video. Flash forward a few months and they have no idea how it’s performing or if they’re getting any return on their investment. You’re here for video inspiration, so you know a subpar or mediocre explainer won’t drive results for your business. A good video makes your audience think, feel something, and then act. Think, feel, do. How do the top-notch explainer videos in this article make that happen? They’re grounded in solid strategy and concrete goals that guide video creation and how it’s used. That’s how you create a video that makes it onto our list—by setting it up for success long before you start pricing out agencies and thinking about scripts. While the popcorn pops, we’ll cover everything you need to do before you start thinking about aesthetics and animation styles. Then we’ll unveil the explainers that scored a coveted spot on our list. Note: At Explainify, we create custom explainer videos that tie directly to your business goals. Book a free 30-minute call with us to see if we’re a good fit for your business. A lot of planning and goal-setting goes into the best explainer videos—before they ever approach a video creation agency. If you want to build a homerun explainer video like our picks below, let’s talk about what you need to do, think about, and plan for, before you create a video. As a marketer, you know how valuable a well-executed video can be for your business. But your boss? Does she get it? What about her boss? A winning strategy for your video is built from the input of a lot of stakeholders—so is your budget. That’s why the very first step is to get everyone on the same page. Plenty of today’s professionals think video marketing is cool or “the future,” but few really understand what it can do for your business or how powerful video can be. Before you can develop a strategy complete with realistic goals and a plan for how to use the video, you need to educate all of the stakeholders on the project. A lot of people think videos can just magically drive leads, but they’re only as effective as the plan you’ve put in place to promote and use them. Videos are a tool you can use in a variety of ways—and how you’ll use it plays a big part in helping you figure out what information to include, what the tone should be, how long to make the video, and more. A brand explainer video shows the audience what your business is all about—your mission, who you serve, and what products or services you offer. These are designed to be used at the top of your marketing or sales funnel, when leads are just learning about your company. A product explainer video gives specific instructions and details on how a particular product works, making it easier for customers to envision the product and, ultimately, use it. A sales explainer video can draw on brand and product information but it’s designed more for conversion—to target leads in the bottom of your sales funnel—and often used by the sales team. Without proper audience research and segmentation, your video can easily fall on deaf ears, even if you get promotion right. Our picks for best explainer videos all start by targeting a very specific group of people. Everything about your video, from the animation style to how long it should be, is driven by your target audience. It’s vital that you know who those people are—that you understand their needs, their struggles, and what makes them tick. How does your brand or product fit into their lives? How do they talk about products like yours? How do they talk about their problem? Where will they come into contact with your brand and, ultimately, the video? Before your video can make them think, feel something, and eventually do something, it needs to speak to that audience exclusively. If you haven’t planned or created an explainer video before, we know all of the above can feel overwhelming. It’s tough to know what to expect from the creation process and the end result. We’ve studied and created tons of top-notch explainer videos like the ones in this article, and we’ve learned a thing or two along the way. That’s why you can always give yourself a little head start by talking to an Explainify video expert to better understand your options and the best way to set your video up for success. And if you don’t believe us 😉 We are recognized as a top Video Production Company on DesignRush. 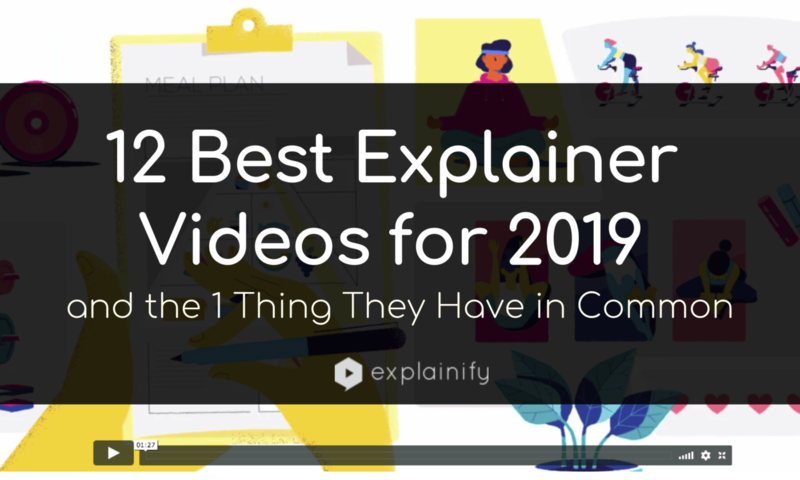 Now that you know what the best explainer videos are made of, at long last and without further ado, here are our picks for the best explainer videos of 2018—to inspire your 2019 plans. Why we love it: ServiceTitan goes all in on the emotion—speaking directly to their target audience and showcasing what drives their brand. Why we love it: The imagery strikes a perfect balance between Tyson’s flagship products (what they’re known for) and their internal work and goals and for the community. Why we love it: This video does a great job of evoking YouTube’s brand while opening the conversation about the Partner Campaign and the benefits publishers enjoy. Why we love it: The video keeps it simple—It showcases the product and how it works well. You’re able to see and easily relate to the scenarios in the animation. Why we love it: Kasra’s video walks viewers step-by-step through every part of their production process, helping to set the right expectations for customers and leads. Why we love it: Headspace takes a new product, creatively and simply explains something many potential customers might be wondering: what does a meditation app do? Why we love it: The video explains Heartland’s product in such matter of fact terms that it makes buying a no-brainer next step. Why we love it: This video is about people even though it doesn’t use a person as the main character—you’re still able to identify and understand the product and the problems it can solve for you. Why we love it: This video devotes a larger than average amount of time speaking to the customer’s struggle, so viewers are ready to hear about Decibel’s solution and what it can do for their analytics and marketing. Note: Need a high-quality explainer video plus a smart strategy for how to use it? Book a free 30-minute call with us to see if we’re a good fit for your business.